I first heard about the World Wide Web while working at Golden Gate University in 1995. Sharon who worked with me was assigned to study Mosaic and to see what this was about. I remember her talking about how neat it was to see a live camera picture of traffic in San Diego. 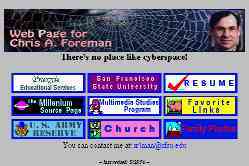 In December of 1995, I attended a Web class at San Francisco State University. It was very elementary, but I learned to insert images in link to other pages. I was making a part of my site that focused on the Millenium (The Millenium Source Page). I put the files on a floppy disk and brought them to the computer lab at SFSU. It didn't work the first time because I didn't match case (upper and lower) as I made tags to files. It worked on my computer, but not on the Mac servers.This is an archive of my first web site in May of 1996. 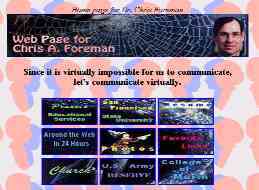 This is my second web site tweaked in January of 1997. I liked the Mickey Mouse Sorcerer picture, so I sliced it up into 9 pieces. I also liked the backgroud that I make of silouettes of my family. These came from paper cuttings made at Disneyland in '89. At this time I was writing an online book about learning the WWW (Around the Web in 24 hours). The files were still on the SFSU server. 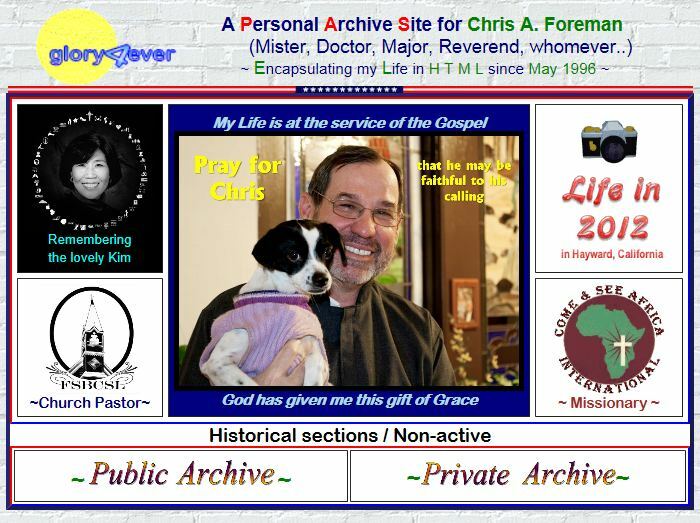 This is my third web site over hauled September of 1998. I used an old picture of myself, letters cut from magazines and scrabble letters. My site was now hosted by Netcom. At this point, I was teaching a Web class at the College of Marin. I put more time into the site in order to show it during my class. That's what "15 sites that teach the intenet" is about. "Praxxis" was my self-employment contracting name. 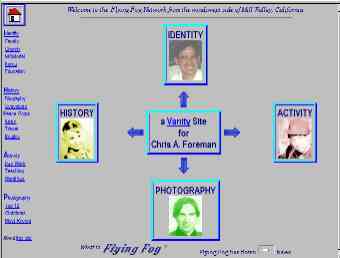 This is my fourth web site started in April of 1999. I learned how to make a banner for the start page and I incorporated the animated GIF. This site was now primarily a teaching tool for classes I taught at the College of Marin and at Drake HS. 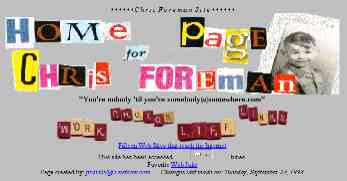 This is my fifth web site which I began in June of 1999. I re-established my identity as "FlyingFog". I had been in search of a good domain name. I was sitting in the hot tub and was inspired to write this poem, which then led to this name:"Flying Fog greets the Evening Calm, inviting tall eucalyptus to dance and seducing redwoods into song, playing peekaboo with a reluctant moon and chasing melancholy from my soul." 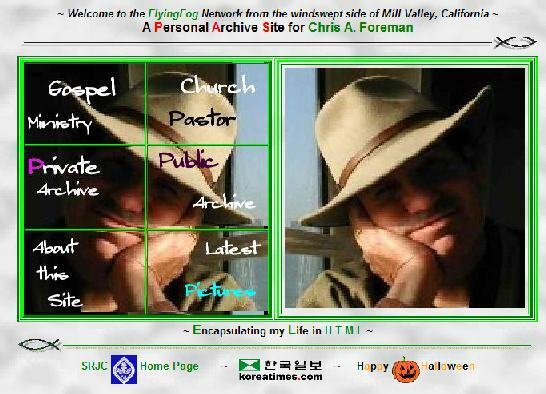 This is my sixth web site started in December of 1999, just before the Millenium turn. That's what the Animated GIF is about. At this point, FlyingFog was a kind of shell for my teaching stuff. This is my eighth web site. I started it in June of 2000. I had some time on my hands I expanded the site over the summer. I added the geneology section. I was also still working fulltime atStarrett's. He just got in his DSL connection! Times were slow and I spent hours working on the site. I did like the spinning cube. I still like it, so maybe I'll bring it back. I kept this site like this for a year. This is ninth site started in June 2001. It was a re-tooling of the previous site. This site I kept for two years. I guess I was happy with it. I did build it up a lot and made internal changes, but the categories stayed pretty much the same. This is my 10th site started in August 2003. This was a major overhaul. After not changing much for over two years, I really changed the archetecture. I had so many pictures and personal things on the site that I wanted it to be half PRIVATE (password protected) and half PUBLIC (non-password protected). Also, I was at long last launching my late-in-life carreer as a pastor. It has been a few months since I began this new site and still I troll my way through it to fix broken links and images. I do hope that I won't make major changes for a long while. 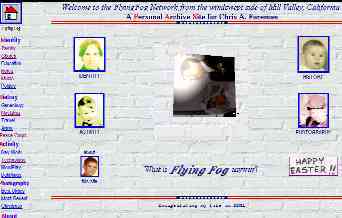 I switched to 1and1 as an internet provider in November, 2004.
flyingfog.net ~ which was my personal archive site. comeandseeafrica.org ~ which was our ministry in Africa. 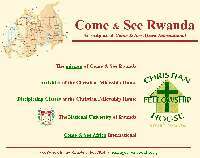 comeandseerwanda.org ~ which was about the activity in Butare. simonforeman.com ~ which was Simon's site that I host for him. < zacharyforeman.com ~ which was a site that I am holding for Zachary. emacsf.org ~ which was for English Ministries for Asian Churches. In October 2006, Kim and I moved from Mill Valley to San Lorenzo. 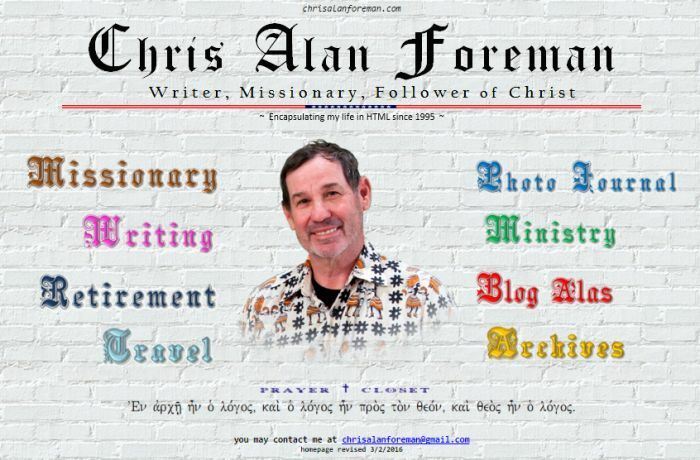 Since I no longer live in a place where fog flies, I decided to change my domain name and re-name it something more in line with my calling as a pastor. 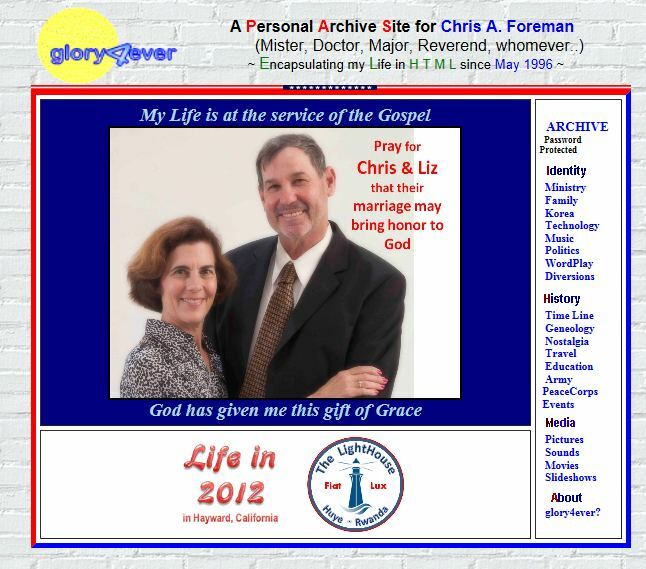 Beginning in November 2006, my personal archive site has been Glory4ever.net". After Kim died in 2010 my websites languished. Here is the site I put together in 2011. 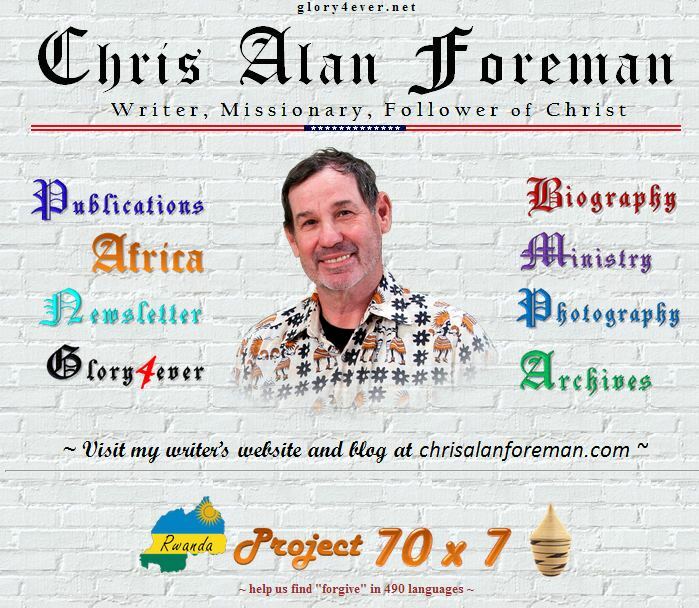 This is my new page as of February 2016.I dropped glory4ever.com as my home page and migrated to chrisalanforeman.com.I hope to sit here to the end. I dropped all passwords for the home page and abandoned my blog (alas!). I spent some time in March/April 2016 fixing broken links with a program called Linkchecker. Finally I got rid of all the broken IMG SRC= and A HREF= broken links.